(MoneyWatch) The Federal Reserve is continuing its therapy of low interest rates and bond purchases to nurse the U.S. economy back to health. The policy comes amid considerable uncertainty about the strength of the recovery, fiscal policy and European financial stability. Closing a two-day meeting, officials with the central bank's policy-setting committee expect the recovery to "proceed at a moderate pace" and for unemployment to decline "gradually." However, the Fed acknowledged that the jobless rate, at 7.7 percent, remains elevated and still far above the 6.5 percent threshold the bank has set before it considers changing its interest rate policy. Is a stock market bubble brewing? The Federal Open Market Committee also said that inflation has been running "somewhat below" its longer-run goal of 2 percent, while "inflation expectations have remained stable" and well below the Fed's 2.5 percent threshold. This also points to a continuation of present policy. The Fed noted that "fiscal policy has become somewhat more restrictive," which works against the recovery, a theme that Fed Chairman Ben Bernanke echoed in press conference after the meeting. Bernanke said that monetary policy can partially, but not fully, offset the economic drag from fiscal policy. This deterioration in the economic outlook gives the Fed yet another reason to continue to try to stimulate the economy through monetary policy, he said. The banking and fiscal crisis in Cyprus, which has sparked fresh concerns about financial contagion in Europe, adds further uncertainty and risk. 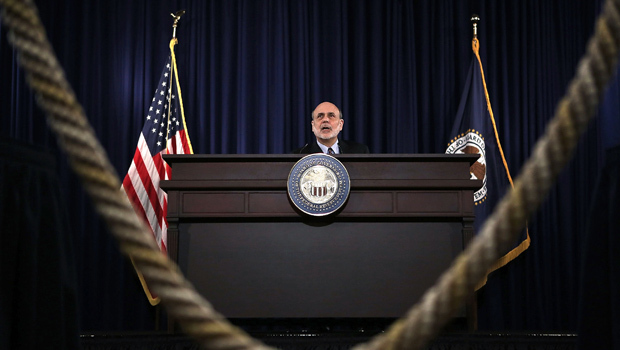 Bernanke said the Fed has taken steps to ensure that financial shocks in Europe do not significantly affect the U.S. Such pledges, even if the U.S. economy escapes unscathed, are not entirely reassuring. Prior to the housing market bubble and financial crash, then Fed Chairman Alan Greenspan assured that if problems developed in these markets the costs could be contained. That forecast turned out to be dead wrong. So despite the Fed's public assurances that the costs can be contained within Europe, considerable uncertainty remains. With all these risk, uncertainties, and drags on the recovery, shouldn't the Fed follow the advice of many outside analysts and try to do even more to help the economy and the unemployed? In the press conference, Bernanke said that it comes down to weighing the costs and benefits of more aggressive action. The Fed does not believe that, with all it has done already, the benefits of doing more would be very large. But the bank does see the potential for bubbles in some financial markets. Some markets appear -- to borrow a word from the Greenspan Fed -- frothy. The Fed is wary of how additional quantitative easing -- a policy under which it is buying $85 billion per month in bonds -- would impact financial markets. In the Fed's view, policy has been calibrated to optimally balance these costs and benefits, and unless conditions change significantly and unexpectedly, there is no reason to alter its present policy in either direction.